Achieving the perfect ‘Glow’ with cheap high street products! AS IF it’s Wednesday already! Seriously! I can’t even look forward to the weekend because I am working on Saturday 🙁 but is suppose I’ve still got Sunday and the girls are coming up for brunch! On to the subject…. so I wanted to show you these amazing products from Make up Revolution and the I Heart Makeup Blushing Hearts. If you like picking up bargains, then this post is for you, because I love all three of these and I think they came to £11 all together! Massive bargain. So if you’re a fan of the Urban Decay palettes (like me) but you’re on a budget to get another one, then maybe give this a go. This is £4!!!! Honestly, you can’t really go wrong with it because it is so cheap. I have the naked palette 2 so I wanted to try out some pinks, and this is perfect! I’d say the only thing that doesn’t quite compare is the application, as you need to put quite a lot on, as compared to the urban decay palette it applies really well. But it is a lovely palette and I will be using this very often! I just loved the look of this product, I love buying something that has a few different shades and this is so lovely! It’s not too much, which I love for everyday use and it adds a lovely shimmer. I apply this to the top of my cheekbone to highlight, and it has such a nice finish! Also this is only £3! I actually think this is my favourite product of 2017 so far! It slays, literally, You only really need a little bit on the top of your cheekbone and you SHINE!! it’s only got a nice rosy tint so I use it as a blusher as well. It’s really such a great product and it’s yours for £4.99! Such a bargain- this will definitely be one of those products I buy time and time again. Also, how pretty is it!!!! Have a lovely evening everyone, and let me know if you have tried any of these or if you would like to give them a go? 2 of them will be featuring in my first giveaway this month! – keep your eye out on my social media channels! Lovely photos – those brushes are the perfect finishing touch too! Good to know about those palettes – I love the Urban Decay ones but ££! I love these kind of posts! I always like to know about the good products that are cheap! Thank you for you recommendation, I really want to try the palette! The packagaing of these products makes them look so much more expensive (if that even makes sense)!! Make Up Revolution has been popping up so often lately that I think I need to start trying out their products! This palette looks really nice. I love makeup revolution! They do amazing dupes for high end products! These are so beautiful! I want them all?❤️ Great post! Your pictures are so good!! Great post lovely, love the brushes! Thankyou for this post! Need there brushes in my life! I’m not committed to paying for real technique metal collection ?? Lovely post & lovely pics! 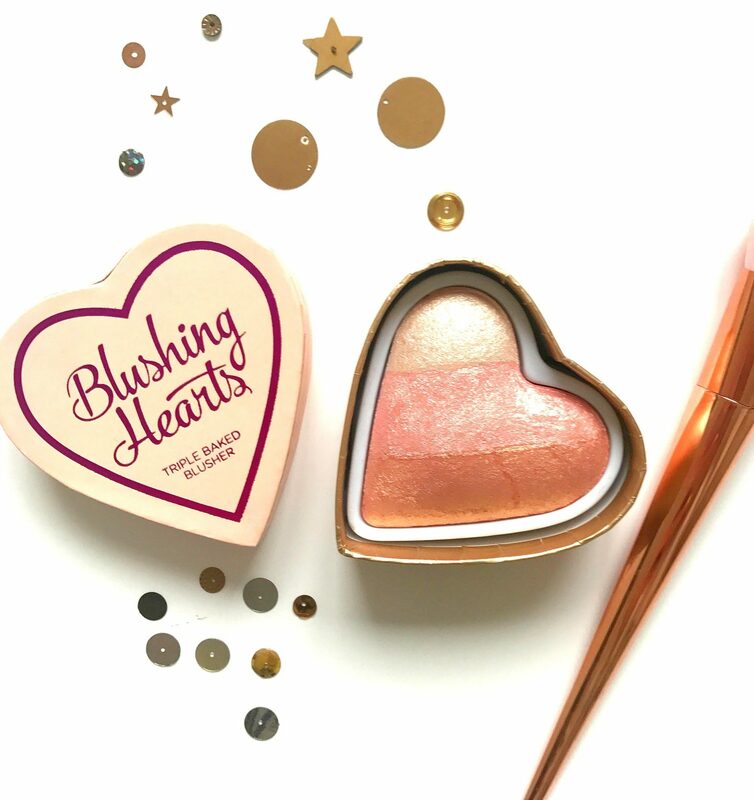 I love a good “glow”, I really wanna try the Makeup Blushing Hearts now after seeing this! 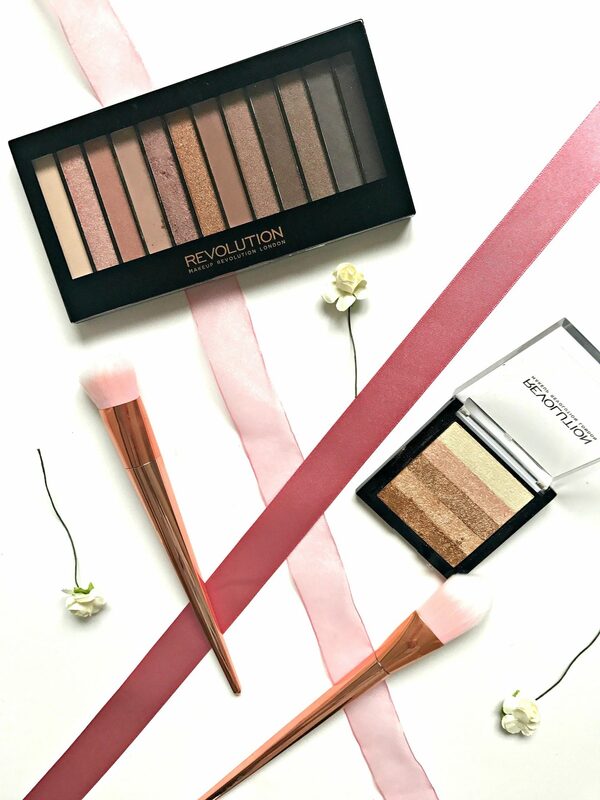 Makeup Revolution is such a fab brand isn’t it! Love those brushes wow!